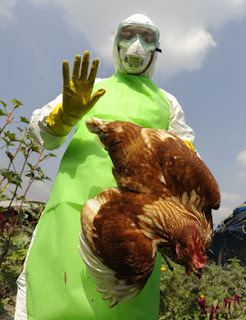 Cameroon's government says that the H5N1 strain of the bird flu virus has reappeared in Cameroon after an 8-year absence. Livestock minister Dr Taiga said one person is hospitalised and Cameroon has reported the death of at least 15 000 birds since May 22. He said the country is taking measures to protect both people and birds from further contamination. Taiga said that 20 000 birds at the affected Mvog Betsi poultry farm in the capital, Yaounde, will be killed. He said Cameroon has dispatched veterinary staff to all regions of the country to check if there may be other cases and is urging its citizens to report suspected cases. Poultry farms in Cameroon reported only several hundred deaths in 2008.